Saint Joseph, I, your unworthy child, greet you. You are the faithful protector and intercessor of all who love and venerate you. You know that I have special confidence in you and that, after Jesus and Mary, I place all my hope of salvation in you, for you are especially powerful with God and will never abandon your faithful servants; therefore I humbly invoke you and commend myself, with all who are dear to me and all that belong to me, to your intercession. I beg of you, by your love for Jesus and Mary, not to abandon me during life and to assist me at the hour of my death. Remember, most pure spouse of Mary, ever Virgin, my loving protector, Saint Joseph, that no one ever had recourse to your protection or asked for your aid without obtaining relief. Confiding; therefore, in your goodness, I come before you and humbly implore you. Despise not my petitions, foster-father of the Redeemer, but graciously receive them. Amen. Saint Joseph, you were privileged to share in the mystery of the Incarnation as the foster-father of Jesus. Mary alone was directly connected with the fulfillment of the mystery, in that she gave her consent to Christ's conception and allowed the Holy Spirit to form the sacred humanity of Jesus from her blood. You had a part in this mystery in an indirect manner, by fulfilling the condition necessary for the Incarnation - the protection of Mary's virginity before and during your married life with her. You made the virginal marriage possible, and this was a part of God's plan, foreseen, willed, and decreed from all eternity. In a more direct manner you shared in the support, upbringing, and protection of the Divine Child as His foster-father. For this purpose the Heavenly Father gave you a genuine heart of a father - a heart full of love and self-sacrifice. With the toil of your hands you were obliged to offer protection to the Divine Child, to procure for Him food, clothing, and a home. You were truly the Saint of the holy childhood of Jesus - the living created providence which watched over the Christ-Child. When Herod sought the Child to put Him to death, the Heavenly Father sent an angel but only as a messenger, giving orders for the flight; the rest He left entirely in your hands. It was that fatherly love which was the only refuge that received and protected the Divine Child. Your fatherly love carried Him through the desert into Egypt until all enemies were removed. Then on your arms the Child returned to Nazareth to be nourished and provided for during many years by the labor of your hands. Whatever a human son owes to a human father for all the benefits of his up-bringing and support, Jesus owed to you, because you were to Him a foster-father, teacher, and protector. You served the Divine Child with a singular love. God gave you a heart filled with heavenly, supernatural love - a love far deeper and more powerful than any natural father's love could be. You served the Divine Child with great unselfishness, without any regard to self-interest, but not without sacrifices. You did not toil for yourself, but you seemed to be an instrument intended for the benefit of others, to be put aside as soon as it had done its word, for you disappeared from the scene once the childhood of Jesus had passed. You were the shadow of the Heavenly Father not only as the Earthly representative of the authority of the Father, but also by means of your fatherhood - which only appeared to be natural - you were to hide for a while the divinity of Jesus. What a wonderfully sublime and divine vocation was yours - the loving Child which you carried in your arms, and loved and served so faithfully, had God in Heaven as Father and was Himself God! Yours is a very special rank among the Saints of the Kingdom of God, because you were so much a part of the very life of the Word of God made Man. In your house at Nazareth and under your care the redemption of mankind was prepared. What you accomplished, you did for us. You are not only a powerful and great Saint in the Kingdom of God, but a benefactor of the whole of Christendom and mankind. Your rank in the Kingdom of God, surpassing far in dignity and honor of all the angels, deserves our very special veneration, love, and gratitude. Saint Joseph, I thank God for your privilege of having been chosen by God to be the foster-father of His Divine Son. As a token of your own gratitude to God for this your greatest privilege, obtain for me the grace of a very devoted love for Jesus Christ, my God and my Savior. Help me to serve Him with some of the self-sacrificing love and devotion which you had while on this Earth with Him. Grant that through your intercession with Jesus, your foster-Son, I may reach the degree of holiness God has destined for me, and save my soul. Saint Joseph, I honor you as the true husband of Mary. Scripture says, "Jacob begat Joseph, the husband of Mary, and of her was born Jesus who is called Christ" (Matthew 1:16). Your marriage to Mary was a sacred contract by which you and Mary gave yourselves to each other. Mary really belonged to you with all she was and had. You had a right to her love and obedience; and no other person so won her esteem, obedience, and love. You were also the protector and witness of Mary's virginity. By your marriage you gave to each other your virginity, and also the mutual right over it - a right to safeguard the others' virtue. This mutual virginity also belonged to the divine plan of the Incarnation, for God sent His angel to assure you that motherhood and virginity in Mary could be united. This union of marriage not only brought you into daily familiar association with Mary, the loveliest of God's creatures, but also enabled you to share with her a mutual exchange of spiritual goods. And Mary found her edification in your calm, humble, and deep virtue, purity, and sanctity. What a great honor comes to you from this close union with her whom the Son of God calls Mother and whom He declared the Queen of Heaven and Earth! Whatever Mary had belonged by right to you also, and this included her Son, even though He had been given to her by God in a wonderful way. Jesus belonged to you as His legal father. Your marriage was the way which God chose to have Jesus introduced into the world, a great divine mystery from which all benefits have come to us. God the Son confided the guardianship and the support of His Immaculate Mother to your care. Mary's life was that of the Mother of the Savior, who did not come upon Earth to enjoy honors and pleasures, but to redeem the World by hard work, suffering, and the cross. You were the faithful companion, support, and comforter of the Mother of Sorrows. How loyal you were to her in poverty, journeying, work, and pain. Your love for Mary was based upon your esteem for her as Mother of God. After God and the Divine Child, you loved no one as much as her. Mary responded to this love. She submitted to your guidance with naturalness and easy grace and childlike confidence. The Holy Spirit Himself was the bond of the great love which united your hearts. Saint Joseph, you were the man chosen by God the Father. He selected you to be His representative on Earth, hence He granted you all the graces and blessings you needed to be His worthy representative. You were the man chosen by God the Son. Desirous of a worthy foster-father, He added His own riches and gifts, and above all, His love. The true measure of your sanctity is to be judged by your imitation of Jesus. You were entirely consecrated to Jesus, working always near Him, offering Him your virtues, your work, your sufferings, your very life. Jesus lived in you perfectly so that you were transformed into Him. In this lies your special glory, and the keynote of your sanctity. Hence, after Mary, you are the holiest of the Saints. You were chosen by the Holy Spirit. He is the mutual Love of the Father and the Son - the heart of the Holy Trinity. In His wisdom He draws forth all creatures from nothing, guides them to their end in showing them their destiny and giving them the means to reach it. Every vocation and every fulfillment of a vocation proceeds from the Holy Spirit. As a foster-father of Jesus and head of the Holy Family, you had an exalted and most responsible vocation - to open the way for the redemption of the World and to prepare for it by the education and guidance of the youth of the God-Man. In this work you cooperated as the instrument of the Holy Spirit. The Holy Spirit was the guide; you obeyed and carried out the works. How perfectly you obeyed the guidance of the God of Love! The words of the Old Testament which Pharaoh spoke concerning Joseph of Egypt can well be applied to you, "Can we find such another man, that is full of the spirit of God, or a wise man like to him?" (Genesis 41:38). No less is your share in the divine work of God than was that of Egypt. You now reign with your foster-Son and see reflected in the mirror of God's Wisdom the Divine Will and what is of benefit to our souls. Saint Joseph, you lived for one purpose - to be the personal servant of Jesus Christ, the Word made flesh. Your noble birth and ancestry, the graces and gifts, so generously poured out on you by God - all this was yours to serve our Lord better. Every thought, word, and action of yours was a homage to the love and glory of the Incarnate Word. You fulfilled most faithfully the role of a good and faithful servant who cared for the House of God. How perfect was your obedience! Your position in the Holy Family obliged you to command, but besides being the foster-father of Jesus, you were also His disciple. For almost thirty years, you watched the God-Man display a simple and prompt obedience, and you grew to love and practice it very perfectly yourself. Without exception you submitted to God, to the civil rulers, and to the voice of your conscience. When God sent an angel to tell you to care for Mary, you obeyed in spite of the mystery which surrounded her motherhood. When you were told to flee into Egypt under painful conditions, you obeyed without the slightest word of complaint. When God advised you in a dream to return to Nazareth, you obeyed. In every situation your obedience was as simple as your faith, as humble as your heart, as prompt as your love. It neglected nothing; it took in every command. You had the virtue of perfect devotedness, which marks a good servant. Every moment of your life was consecrated to the service of our Lord: sleep, rest, work, pain. Faithful to your duties, you sacrificed everything unselfishly, even cheerfully. You would have sacrificed even the happiness of being with Mary. The rest and quiet of Nazareth was sacrificed at the call of duty. Your entire life was one generous giving, even to the point of being ready to die in proof of your love for Jesus and Mary. With true unselfish devotedness you worked without praise or reward. But God wanted you to be in a certain sense a cooperator in the Redemption of the world. He confided to you the care of nourishing and defending the Divine Child. He wanted you to be poor and to suffer because He destined you to be the foster-father of His Son, who came into the world to save men by His sufferings and death, and you were to share in His suffering. In all of these important tasks, the Heavenly Father always found you a faithful servant! Saint Joseph, I thank God for your privilege of being God's faithful servant. As a token of your own gratitude to God, obtain for me the grace to be a faithful servant of God as you were. Help me to share, as you did, the perfect obedience of Jesus, who came not to do His Will, but the Will of His Father; to trust in the Providence of God, knowing that if I do His Will, He will provide for all my needs of soul and body; to be calm in my trials and to leave it to our Lord to free me from them when it pleases Him to do so. And help me to imitate your generosity, for there can be no greater reward here on Earth than the joy and honor of being a faithful servant of God. Saint Joseph, God has appointed you patron of the Catholic Church because you were the head of the Holy Family, the starting-point of the Church. You were the father, protector, guide and support of the Holy Family. For that reason you belong in a particular way to the Church, which was the purpose of the Holy Family's existence. I believe that the Church is the family of God on Earth. Its government is represented in priestly authority which consists above all in its power over the true Body of Christ, really present in the Blessed Sacrament of the Altar, thus continuing Christ's life in the Church. From this power, too, comes authority over the Mystical Body of Christ, the members of the Church - the power to teach and govern souls, to reconcile them with God, to bless them, and to pray for them. You have a special relationship to the priesthood because you possessed a wonderful power over our Savior Himself. Your life and office were of a priestly function and are especially connected with the Blessed Sacrament. To some extent you were the means of bringing the Redeemer to us - as it is the priest's function to bring Him to us in the Mass - for you reared Jesus, supported, nourished, protected and sheltered Him. You were prefigured by the patriarch Joseph, who kept supplies of wheat for his people. But how much greater than he were you! Joseph of old gave the Egyptians mere bread for their bodies. You nourished, and with the most tender care, preserved for the Church Him who is the Bread of Heaven and who gives eternal life in Holy Communion. God has appointed you patron of the Church because the glorious title of patriarch also falls by special right to you. The patriarchs were the heads of families of the Chosen People, and theirs was the honor to prepare for the Savior's incarnation. You belonged to this line of patriarchs, for you were one of the last descendants of the family of David and one of the nearest forebears of Christ according to the flesh. As husband of Mary, the Mother of God, and as the foster-father of the Savior, you were directly connected with Christ. Your vocation was especially concerned with the Person of Jesus; your entire activity centered about Him. You are; therefore, the closing of the Old Testament and the beginning of the New, which took its rise with the Holy Family of Nazareth. Because the New Testament surpasses the Old in every respect, you are the patriarch of patriarchs, the most venerable, exalted, and amiable of all the patriarchs. Through Mary, the Church received Christ, and therefore the Church is indebted to her. But the Church owes her debt of gratitude and veneration to you also, for you were the chosen one who enabled Christ to enter into the world according to the laws of order and fitness. It was by you that the patriarchs and the prophets and the faithful reaped the fruit of God's promise. Alone among them all, you saw with your own eyes and possessed the Redeemer promised to the rest of men. Saint Joseph, I thank God for your privilege of being the Patron of the Church. As a token of your own gratitude to God, obtain for me the grace to live always as a worthy member of this Church, so that through it I may save my soul. Bless the priests, the religious, and the laity of the Catholic Church, that they may ever grow in God's love and faithfulness in His service. Protect the Church from the evils of our day and from the persecution of her enemies. Through your powerful intercession may the church successfully accomplish its mission in this world - the glory of God and the salvation of souls! Saint Joseph, I venerate you as the gentle head of the Holy Family. The Holy Family was the scene of your life's work in its origin, in its guidance, in its protection, in your labor for Jesus and Mary, and even in your death in their arms. You lived, moved, and acted in the loving company of Jesus and Mary. The inspired writer describes your life at Nazareth in only a few words, "And (Jesus) went down with them and came to Nazareth, and was subject to them" (Luke 2:51). Yet these words tell of your high vocation here on Earth, and the abundance of graces which filled your soul during those years spent in Nazareth. Your family life at Nazareth was all radiant with the light of divine charity. There was an intimate union of heart and mind among the members of your Holy Family. There could not have been a closer bond than that uniting you to Jesus, your foster-Son and to Mary, your most loving wife. Jesus chose to fulfill toward you, His foster-father, all the duties of a faithful son, showing you every mark of honor and affection due to a parent. And Mary showed you all the signs of respect and love of a devoted wife. You responded to this love and veneration from Jesus and Mary with feelings of deepest love and respect. You had for Jesus a true fatherly love, enkindled and kept aglow in your heart by the Holy Spirit. And you could not cease to admire the workings of grace in Mary's soul, and this admiration caused the holy love which you had consecrated to her on the day of your wedding grow stronger every day. God has made you a heavenly patron of family life because you sanctified yourself as head of the Holy Family and thus by your beautiful example sanctified family life. How peacefully and happily the Holy Family rested under the care of your fatherly rule, even in the midst of trials. You were the protector, counselor, and consolation of the Holy Family in every need. And just as you were the model of piety, so you gave us by your zeal, your earnestness and devout trust in God's providence, and especially by your love, the example of labor according to the Will of God. You cherished all the experiences common to family life and the sacred memories of the life, sufferings, and joys in the company of Jesus and Mary; therefore, the family is dear to you as the work of God, and it is of the highest importance in your eyes to promote the honor of God and the well-being of man. In your loving fatherliness and unfailing intercession you are the patron and intercessor of families, and you deserve a place in every home. Saint Joseph, I thank God for your privilege of living in the Holy Family and being its head. As a token of your own gratitude to God, obtain God's blessing upon my own family. Make our home the Kingdom of Jesus and Mary - a Kingdom of peace, of joy, and love. I also pray for all Christian families. Your help is needed in our day when God's enemy has directed his attack against the family in order to desecrate and destroy it. In the face of these evils, as patron of families, be pleased to help; and as of old, you arose to save the Child and His Mother, so today arise to protect the sanctity of the home. Make our homes sanctuaries of prayer, of love, of patient sacrifice, and of work. May they be modeled after your own at Nazareth. Remain with us with Jesus and Mary, so that by your help we may obey the commandments of God and of the Church; receive the holy sacraments of God and of the Church; live a life of prayer; and foster religious instruction in our homes. Grant that we may be reunited in God's Kingdom and eternally live in the company of the Holy Family in Heaven. Saint Joseph, you devoted your time at Nazareth to the work of a carpenter. It was the Will of God that you and your foster-Son should spend your days together in manual labor. What a beautiful example you set for the working classes! It was especially for the poor, who compose the greater part of mankind, that Jesus came upon Earth, for in the synagogue of Nazareth, He read the words of Isaiah and referred them to Himself, "The Spirit of the Lord is upon me, because He has anointed Me to bring good news to the poor..." (Luke 4:18). It was God's Will that you should be occupied with work common to poor people, that in this way Jesus Himself might ennoble it by inheriting it from you, His foster-father, and by freely embracing it. Thus our Lord teaches us that for the humbler class of workmen, He has in store His richest graces, provided they live content in the place God's Providence has assigned them, and remain poor in spirit for He said, "Blessed are the poor in spirit, for theirs is the Kingdom of Heaven" (Matthew 5:3). The kind of work to which you devoted your time in the workshop of Nazareth offered you many occasions of practicing humility. You were privileged to see each day the example of humility which Jesus practiced - a virtue most pleasing to Him. He chose for His Earthly surroundings not the courts of princes nor the halls of the learned, but a little workshop of Nazareth. Here you shared for many years the humble and hidden toiling of the God-Man. What a touching example for the worker of today! While your hands were occupied with manual work, your mind was turned to God in prayer. From the Divine Master, who worked along with you, you learned to work in the presence of God in the spirit of prayer, for as He worked He adored His Father and recommended the welfare of the world to Him, Jesus also instructed you in the wonderful truths of grace and virtue, for you were in close contact with Him who said of Himself, "I am the Way and the Truth and the Life." As you were working at your trade, you were reminded of the greatness and majesty of God, who, as a most wise Architect, formed this vast universe with wonderful skill and limitless power. The light of divine faith that filled your mind, did not grow dim when you saw Jesus working as a carpenter. You firmly believed that the saintly Youth working beside you was truly God's own Son. Saint Joseph, I thank God for your privilege of being able to work side by side with Jesus in the carpenter shop of Nazareth. As a token of your own gratitude to God, obtain for me the grace to respect the dignity of labor and ever to be content with the position in life; however lowly, in which it may please Divine Providence to place me. Teach me to work for God and with God in the spirit of humility and prayer, as you did, so that I may offer my toil in union with the sacrifice of Jesus in the Mass as a reparation for my sins, and gain rich merit for heaven. 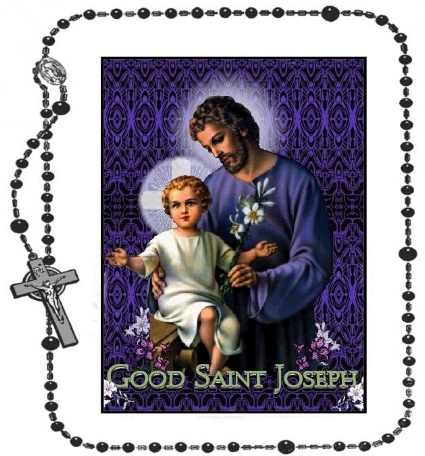 Saint Joseph, your share of suffering was very great because of your close union with the Divine Savior. All the mysteries of His life were more or less mysteries of suffering. Poverty pressed upon you, and the cross of labor followed you everywhere. Nor were you spared domestic crosses, owing to misunderstandings in regard to the holiest and most cherished of all beings, Jesus and Mary, who were all to you. Keen must have been the suffering caused by the uncertainty regarding Mary's virginity; by the bestowal of the name of Jesus, which pointed to future misfortune. Deeply painful must have been the prophecy of Simeon, the flight into Egypt, the disappearance of Jesus at the Paschal feast. To these sufferings were surely added interior sorrow at the sight of the sins of your own people. You bore all this suffering in a truly Christ-like manner, and in this you are our example. No sound of complaint or impatience escaped you - you were, indeed, the silent Saint! You submitted to all in the spirit of faith, humility, confidence, and love. You cheerfully bore all in union with and for the Savior and His Mother, knowing well that true love is a crucified love. But God never forsook you in your trials. The trials, too, disappeared and were changed at last into consolation and joy. It seems that God had purposely intended your life to be filled with suffering as well as consolation to keep before my eyes the truth that my life on Earth is but a succession of joys and sorrows, and that I must gratefully accept whatever God sends me, and during the time of consolation prepare for suffering. Teach me to bear my cross in the spirit of faith, of confidence, and of gratitude toward God. In a happy eternity, I shall thank God fervently for the sufferings which He deigned to send me during my pilgrimage on Earth, and which after your example I endured with patience and heartfelt love for Jesus and Mary. You were truly the martyr of the hidden life. This was God's Will, for the holier a person is, the more he is tried for the love and glory of God. If suffering is the flowering of God's grace in a soul and the triumph of the soul's love for God, being the greatest of Saints after Mary, you suffered more than any of the martyrs. Because you have experienced the sufferings of this valley of tears, you are most kind and sympathetic toward those in need. Down through the ages souls have turned to you in distress and have always found you a faithful friend in suffering. You have graciously heard their prayers in their needs even though it demanded a miracle. Having been so intimately united with Jesus and Mary in life, your intercession with Them is most powerful. Saint Joseph, I thank God for your privilege of being able to suffer for Jesus and Mary. As a token of your own gratitude to God, obtain for me the grace to bear my suffering patiently for love of Jesus and Mary. Grant that I may unite the sufferings, works and disappointments of life with the sacrifice of Jesus in the Mass, and share like you in Mary's spirit of sacrifice. Saint Joseph, I thank God for your privilege of being able to die in the arms of Jesus and Mary. As a token of your own gratitude to God, obtain for me the grace of a happy death. Help me to spend each day in preparation for death. May I, too, accept death in the spirit of resignation to God's Holy Will, and die, as you did, in the arms of Jesus, strengthened by Holy Viaticum, and in the arms of Mary, with her rosary in my hand and her name on my lips!